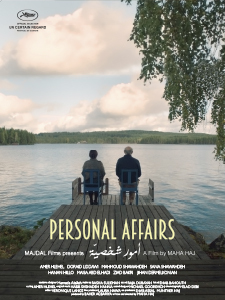 Personal Affairs, debut feature film by Maha Haj, is about family relationships and loneliness, made with humor and charm. Although it is slow-moving, and many sequences have a lot of quiet, the tone of this award-winning film is surprisingly compelling. The story is about an older Christian couple, living in Nazareth. The father is obsessed with the internet, the mother with her knitting and her soap operas. They have three grown children, all of whom have moved away. Their daughter is married and almost ready to give birth, living in Ramallah. Their two bachelor sons -- one lives in Sweden, another in Ramallah. The vignettes are about relationships – between the parents, between the daughter and her husband, between one of the sons and the object of his love with whom he is incapable of making a commitment. At a premiere screening, last night at the Jerusalem Cinematheque, the filmmaker explained that she chose to use humor, because humor crosses borders. She acknowledged that she shows moods and situations, but hesitates to provide answers as to what will happen or to offer a standard ending. It is the situation, rather than the narrative, that is important. She also said that she moves between imagination and reality, as does the film. According to the filmmaker, the scenes of a dysfunctional family break the stereotype of the warm and supportive Arab family. In fact, parts of the film border on the absurd, and the elderly grandmother provides comic relief. There are also subtle political comments in the film, and a strong feeling of claustrophobia, especially reflected in the son-in-law’s obsession with seeing the sea for the first time in his life. This is a film about checkpoints and reality, but it is mostly about daily routine and dreams, about the dissatisfactions of everyday life, and the need to resolve inter-personal issues. Personal Affairs was screened in Un Certain Regard category at Cannes and was the winner of the award for best Israeli feature film at the Haifa Film Festival. Beginning March 2017, the film will be available from Sophie DulacDistribution.